My mother is actually getting a kick out of hearing stories about our little vegetable patch, because when I was growing up she had to threaten me with no more Star Wars toys, ever, if I didn’t get out and help with the garden. In my defense, our current patch is very small, nothing at all like the half-acre we’d planted in my youth, and our present plants are tomatoes and peppers, which I like – it was very hard to stir adolescent motivation with all of the vegetables my folks had planted that made me gag. By the way, for all of those who insist that in adulthood you’ll start liking all those things you didn’t as a child, let me just say, the attempt to feed me Brussels’ sprouts now is something I consider assault and respond to accordingly. Anyway, yesterday I discovered that the creature scarfing the tops of some of our tomato plants was not the suspected deer in the neighborhood, but a fat tobacco hornworm, the larval stage of a six-spotted sphinx moth (Manduca sexta,) closely related to, and often mistaken for, the tomato hornworm, larva of the five-spotted hawkmoth (Manduca quinquemaculata.) 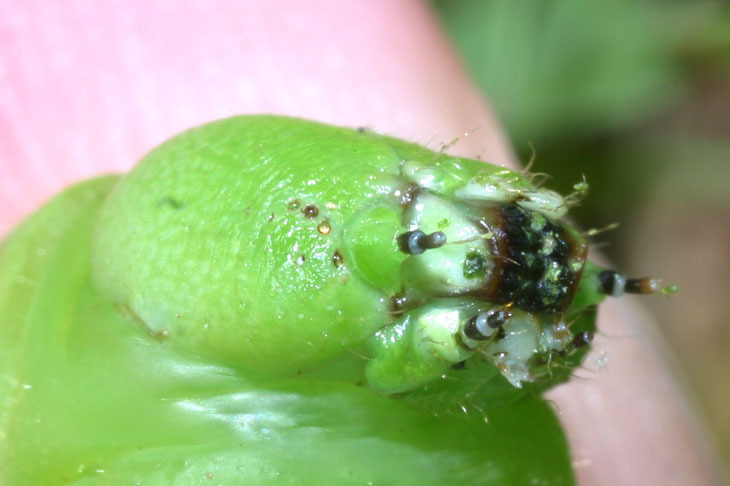 The bane of tomato-growers everywhere, hornworms aren’t really difficult to get rid of, for the home grower anyway – while a little hard to spot, all you have to do is pluck them off and fry them up with a little vinegar and hush puppies. All right, seriously, don’t follow that advice, because hush puppies aren’t very good for you. 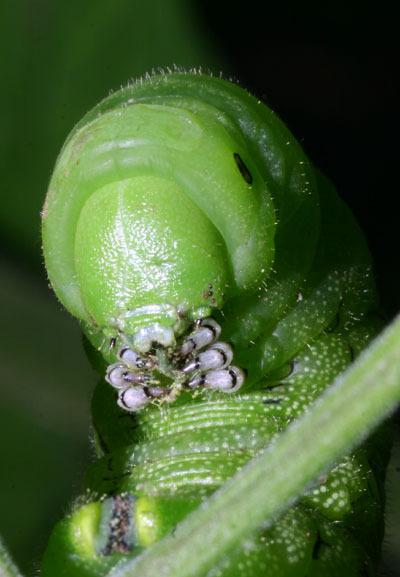 But I suspect people have more of a fear of hornworms since they’re huge as far as caterpillars go, bloated like a Hut, and have a nasty-looking little rapier on their hinders. Since I haven’t ever been tagged by either end of a hornworm, even years ago while fretting over not getting a Star Destroyer for christmas, I’m inclined to say the fears are unjustified. My subject here reluctantly served as a photo model before taking a dip in a nice cool and refreshing bucket of water (they’re also terrible swimmers.) Hey, don’t judge me, this is natural selection; just like tearing into a beehive for honey is a bad move, messin’ with a human’s tended garden is Darwinism at its most efficient. We can see my freeloader munching on a small amount of vegetable matter, and the full-resolution versions makes it appear to be regurgitated which, if true, perhaps makes me more of a kindred spirit with them than ever suspected. It’s easy to make out the small forelegs gripping its food; the hunched posture and little stubby arms up by the [ahem] ‘face,’ almost give it the appearance of a little infant with its bottle. Almost. But for some real detail, we have to go deeper. Are you one of those people who believe you can tell everything about someone by looking deep into their eyes? Well, aside from the fact that you’re definitely on the wrong blog, go ahead and peer away, and tell me what you find here, since those are the eyes lined up at the edge of all the yuck. You might think that, with that many manipulative appendages, hornworms wouldn’t be quite so messy eaters, but I’m here to dash all of your misconceptions today. “But Al,” you say (go ahead, I can hear you,) “don’t tell me you had one of these lovely creatures, shining example of the beauty of gods’ creation as they are, and did not get a closeup of its delicate lips.” [Yes, I’m really that tuned in to the thoughts of my four readers.] Fear not, I say in return, because I often talk that way. I would not deprive you of such an experience, for sleeping soundly too many nights in a row could become boring. Behold! For those of you with little sisters, I will be happy to send you a full-resolution version of this for printing poster size, because I get kickbacks from psychotherapists. 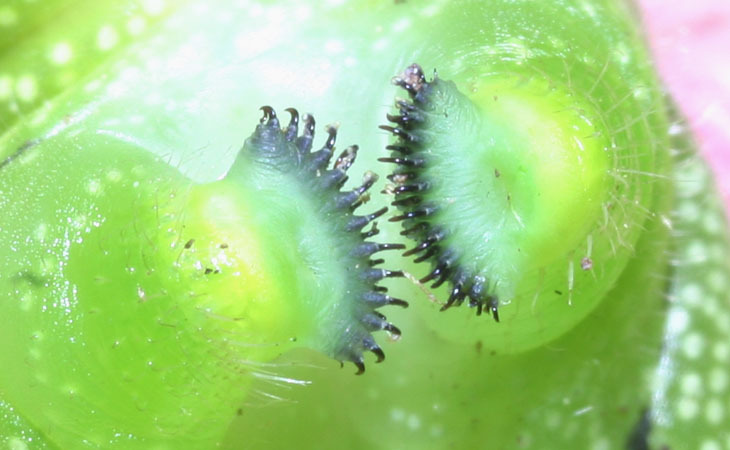 Just don’t ask me if you’re looking at a hornworm tongue here, since no source that I’ve located has diagrammed caterpillar anatomy that distinctly. Just bear one little bit of trivia in mind: this critter (well, not this particular one anymore) will metamorphize into a six-legged flying insect with only a siphon for a mouth. 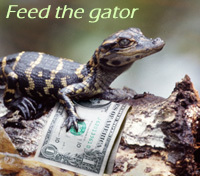 It will sport compound eyes and no little jaws or mouthfingers. If I could get ahold of an adult sphinx moth I’d show you the difference – maybe in a later post. But essentially, moths don’t run into their school classmates and remark how they’ve barely changed a bit. I’m really not creating any new fans of hornworms here, am I? I mean, who wouldn’t envy a species that can count up to 712, and imagine if they learned how to make tiny guitars? As you might have suspected, the pink background that you’ve been seeing here is my own fingers, since The Girlfriend seemed rather cranky about something when I asked for her help. 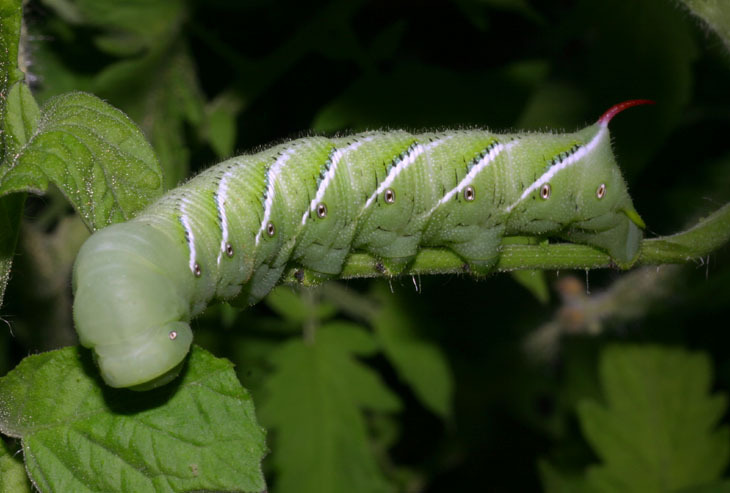 If you’ve been wondering what the difference is between tobacco and tomato hornworms, the answer is, “Not much.” Tomato hornworms have V-shaped white marks on their sides rather than stripes, and straight blue-black horns rather than curved reddish-orange ones. 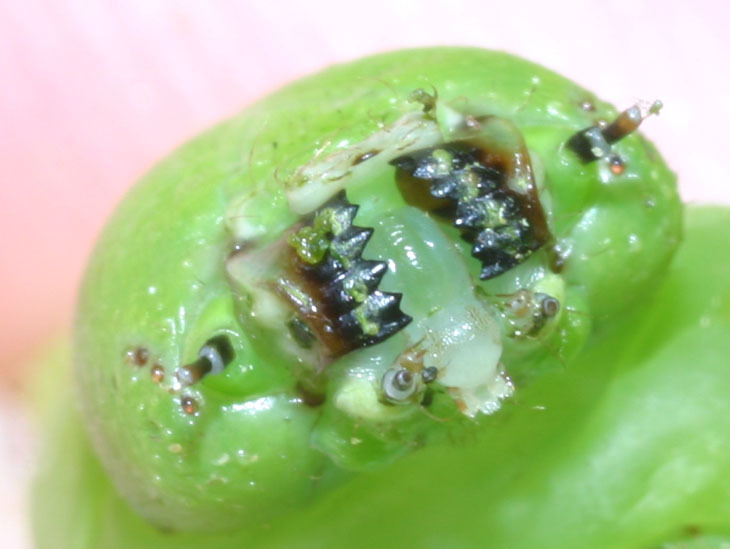 Since tomato and tobacco plants are both from the plant family of Solanaceae, along with potatoes and some peppers, it’s not surprising that the two species of hornworm have such a distinct resemblance, or that they will interchange their host plants and snack on some others. Last year, the hornworms didn’t appear until very late in the growing season, and the Braconid wasps already had things well in hand. Or whatever. 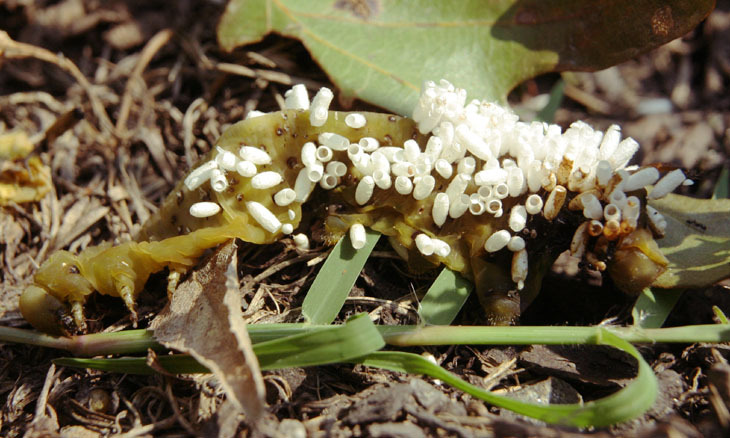 This family of wasps lays their eggs within the body cavity of caterpillars, where the young hatch out and eat the living tissue inside, then go to the skin surface to spin their cocoons on the outside, eventually emerging from the tops as adult wasps. This, perhaps rather obviously, is not too beneficial to the hornworm, as seen here in a photo I obtained last year. I cannot persuade myself that a beneficent and omnipotent God would have designedly created the Ichneumonidae with the express intention of their feeding within the living bodies of Caterpillars, or that a cat should play with mice. Distilling this down, nature itself isn’t good or bad; it just is. The emotional reactions that we get from witnessing any aspect of nature are strictly our own. Hornworms eat our food plants, wasp larvae eat the hornworms; neither one comes from anything planned, antagonistic, or evil. They’ve simply adapted to the conditions available. Brussels’ sprouts, however, are truly hell-spawn. You have been warned.